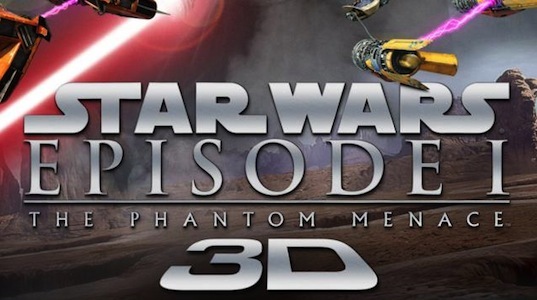 This past weekend saw the re-release of the first Star Wars prequel, The Phantom Menace. It was released in 3D at a time when 3D movies just don't stand up to par, or at least not worth the extra 3-5 dollars charged to see a movie in 3D. But that aside, how did it fare? Was it worth 2 hours of your hard-earned free time? In this moviegoers opinion, no. Episode 1 was released back in 1999 (jeez, that was over 12 years ago!) to an insane amount of buzz. Why wouldn't it? It was the first Star Wars film in 16 years, and promised to start the story of how Luke Skywalker's father, Anakin, became the iconic villain Darth Vader. Every Star Wars nerd and follower on the planet was pumped and ready to throw down hard money to see this movie. When it released and these fanboys saw what they had waited so long to see, the reception was...less than spectacular. Episode 1 was panned by many for its bad writing and some awful characters, most notably Jar Jar Binks. This character's idiotic intelligence, poor character arc, and actor Ahmed Best's poor acting did nothing for Jar Jar. The only things that worked fairly well in this movie was the lightsaber sequence with Qui-Gon, Obi-Wan, and Darth Maul. And even that was criticized for its bad resolution and relative shortness. So how did the 3D re-release turn out? About as well as the original, I'm afraid. The 3D was nothing to brag about, with nothing jumping out and the relative brightness of the film being dimmed by the cheap glasses used for 3D movies. At times, the 3D didn't even seem like 3D. No one scene featured much of an improvement from the original presentation. The CGI of the original was a little crisper than the original, which is no surprise coming from Industrial Light & Magic. But that is about the only thing good for the movie from a technical standpoint. As for the story, it is exactly the same. The only real standout parts were the podrace sequence on Tatooine and the final lightsaber fight between the Jedi and Maul. Jar Jar Binks still brings down this movie in so many ways, just like the original release. Not only Jar Jar, but the whole Gungan race are something to be laughed at, and not in a funny way. More like, "this is so bad that I will forever criticize George Lucas' mental stability". Liam Neeson was still my favorite character in this movie, and a total badass until he took a double-edged lightsaber to the sternum. Although, I love Liam Neeson in just about anything anymore, so I am a little biased on that part. Ewan McGregor did nothing for me in this movie, and came off a little whiny for my taste. Natalie Portman is hot, no doubt about it. Her acting these days has been very good, unlike when she filmed this movie (It's amazing what 12 years of practice can do!). She tries her damnedest to try and pull off something convincing though, but the geisha makeup is still horrid. Jake Lloyd (Anakin) was fairly good playing an innocent slave kid, who tends to get in over his head. His adoration for Padme (Portman) is cute, but knowing where the series goes from here, its hard not to make some funny jokes as commentary (I know I did!). The entire podrace scene was fast paced fun, with enough crashes and spectacle to keep me entertained for a bit. This sequence is what made me buy the original Star Wars: Episode 1 - Racer game for the N64 (it is actually quite fun) and brought back some fond childhood memories. And I'm not sure, but I could have sworn the introductions to some of the other pilots, aside from Quadrinaros, Sebulba, and Ody Mandrell, in the scene were added in for the newest release, or at least made louder. Darth Maul is still the most underrated character in this film, which is somewhat understandable considering he not only handled two veteran Jedi, but killed Qui-Gon and had Obi-Wan dangling down a shaft. The stupid writing to have him just make sparks with his lightsaber over Obi-Wan led to one of the dumbest movie deaths in the last 15 years. If Lucas were to change anything in the prequels, it was this! Over all, this 3D release is not worth the money in my opinion. If you enjoy this movie, as some did, and you feel you HAVE to see it, go ahead. But anyone looking for an enjoyable time at the theaters will be bored and disappointed. If you can, watch, it on Blu-Ray. It's much, much better.